"This is New Mexico's traditional cookie. A great thick sugar cookie that is dusted with cinnamon-sugar. The traditional shape is fleur-de-lis, but use your favorite cookie cutters if you like." Preheat the oven to 350 degrees F (175 degrees C). Sift the flour, baking powder and salt into a bowl, and set aside. In a large bowl, cream together the lard and 1 1/2 cups sugar until smooth. Mix in the anise seed, and beat until fluffy. Stir in the eggs one at a time. Add the sifted ingredients and brandy, and stir until well blended. 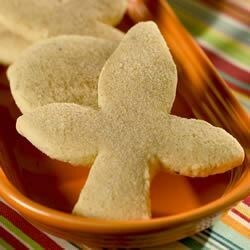 On a floured surface, roll the dough out to 1/2 or 1/4 inch thickness, and cut into desired shapes using cookie cutters. The traditional is fleur-de-lis. Place cookies onto baking sheets. Mix together the 1/4 cup of sugar and cinnamon; sprinkle over the tops of the cookies. Bake for 10 minutes in the preheated oven, or until the bottoms are lightly browned. A deliciously dense and fudge-like, chocolate cookie! Very good sugar cookies with just a hint of licorice flavor! I couldn't find lard so I used butter instead and they still turned out fantastic. The dough came out very dry and so did the cookie. I made two batches, just to make sure I hadn't messed one up and the result was the same. I am glad I came across this recipe. I made about 4 dozen of these cookies they where delicious. Everyone loved them for the holidays they went great with hot chocolate or coffee!!! These are as good as my sister-in-laws SECRET RECIPE that she won't give out. My husband loves biscochitos and these won him over.